This one bowl chocolate cake is moist, delicious, and easy to make. It's topped with a simple 3-ingredient whipped cream cheese ganache and is free of dairy, eggs, and refined sugar (aside from the dark chocolate.) Vegan friendly and includes a gluten-free option too! Preheat oven to 350ºF. Line a 9"x13" pan with parchment paper or generously grease with coconut oil or all-vegetable shortening and set aside. In a large mixing bowl, combine flour, sugar, cocoa, baking powder/soda and salt until well blended. Mix in milk, coffee, oil and vanilla. Pour batter into prepared pan and place into the oven for 25–30 minutes OR just until center is set and a toothpick inserted comes out with only a few moist crumbs. Remove and let cool completely before frosting. Frost cake in the pan or remove and place on a serving platter before frosting. Place chocolate and coconut cream into a heat safe glass or stainless steel mixing bowl. Make a double boiler by placing bowl over a pot filled with 1" of boiling water. Stir chocolate and coconut milk continuously until chocolate is fully melted. Let chocolate mixture cool for 10 minutes and then beat with an electric mixer (preferably a stand mixer if you have it, fitted with the whisk attachment) until fluffy, about 5–10 minutes. While the mixer is running on medium-low speed, slowly add cream cheese a spoonful at a time, letting it blend in before each addition. When it's all added, turn the speed up to high and beat for a few more minutes, until light and fluffy. If mixture is too soft, refrigerate for 15–20 minutes and then beat again for several minutes. If mixture is too firm, add additional coconut milk or coffee until frosting can be easily spread onto the cake. 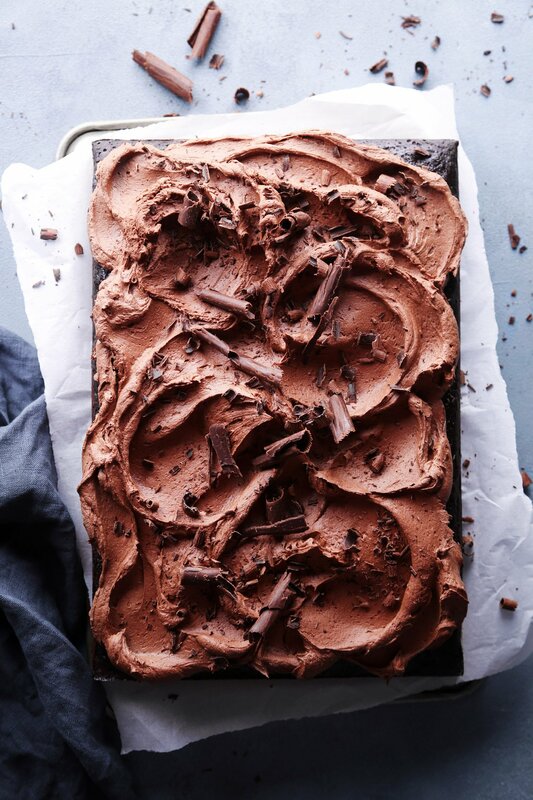 Scoop whipped ganache onto fully cooled cake and use a large offset spatula to smooth all over the top. Top with chopped chocolate or chocolate curls** before serving. *I used semi-sweet, but you can also use milk or dark chocolate. Keep in mind there are no other sweeteners added to the frosting, so the sweetness level of the chocolate will determine the sweetness of the frosting. **To make chocolate curls, heat ½ cup of chocolate chips or chopped chocolate over a double boiler until fully melted. Pour melted chocolate onto the back of a clean cookie sheet and spread into a thin layer evenly across the pan. Chill in the fridge until set, then remove and let sit until it comes to room temperature, about 5 or 10 minutes. Hold a bench scraper or flat edge of a metal spatula at a 45º angle and push against chocolate to scrape it off the pan. It should curl naturally as it comes off the pan. If it is breaking into small pieces, it's not warm enough. Let it in a warm room a little longer before trying again. If it's still melted in some areas, refrigerate a few minutes longer.